Nine years in charge • The popular chief had his share of bitter criticism and no-win situations. 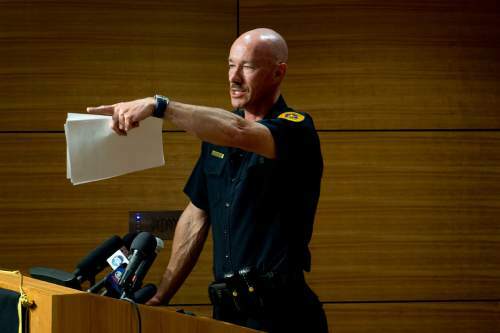 Jeremy Harmon | The Salt Lake Tribune Salt Lake City Police Chief Chris Burbank answers questions on June 27, 2014, during a press conference about the June 18th incident where Officer Brett Olsen shot and killed Sean Kendall's dog, Geist. 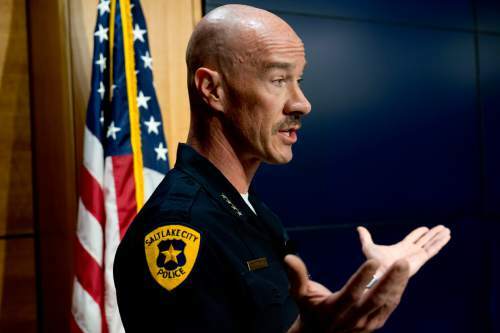 Jeremy Harmon | The Salt Lake Tribune Salt Lake City Police Chief Chris Burbank answers questions on June 27, 2014, during a press conference about the June 18th incident where Officer Brett Olsen shot and killed Sean Kendall's dog, Geist. 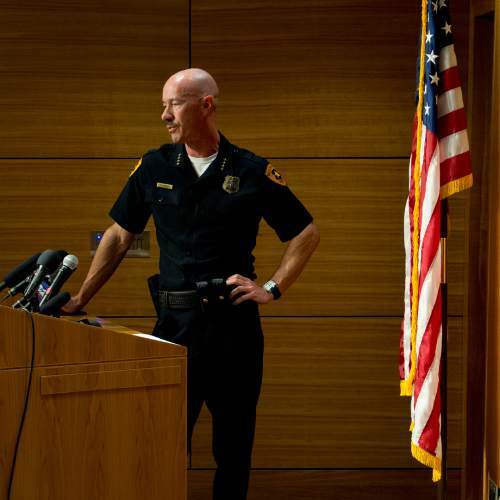 Jeremy Harmon | The Salt Lake Tribune Salt Lake City Police Chief Chris Burbank answers questions on June 27, 2014, during a press conference about the June 18th incident where Officer Brett Olsen shot and killed Sean Kendall's dog, Geist. 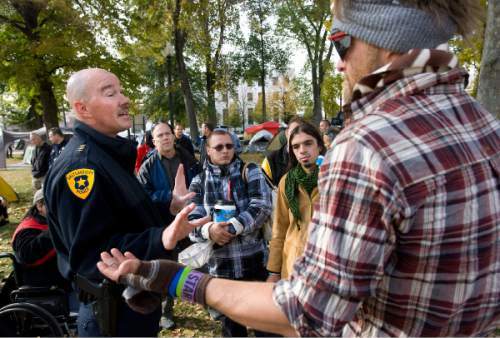 Al Hartmann | The Salt Lake Tribune Salt Lake City Police Chief Chris Burbank, left, reasons with members of the Occupy Salt Lake in Pioneer Park Friday afternoon November 11, 2011. He announced to occupiers that the camp would have to be dismantled and vacated by sundown on Saturday due to a death in the camp earlier on Friday morning and public safety concerns. 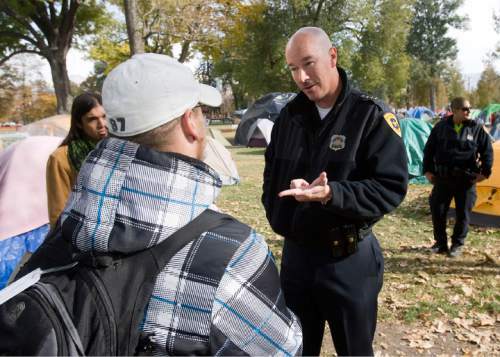 Al Hartmann | The Salt Lake Tribune Salt Lake City Police Chief Chris Burbank reasons with members of the Occupy Salt Lake in Pioneer Park Friday afternoon November 11, 2011. He announced to occupiers that the camp would have to be dismantled and vacated by sundown on Saturday due to a death in the camp earlier on Friday morning and public safety concerns. Jeremy Harmon | Tribune file photo Salt Lake City Police Chief Chris Burbank answers questions during a press conference about the June 18th incident where Officer Brett Olsen shot and killed Sean Kendall's dog, Geist. 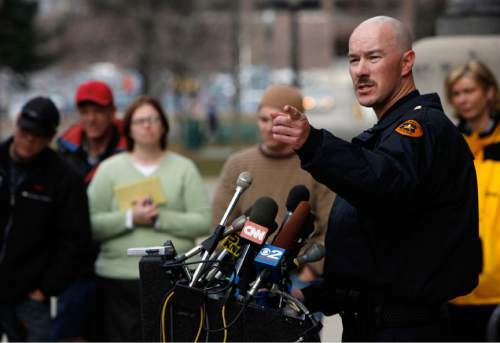 Francisco Kjolseth | The Salt Lake Tribune Salt Lake City police department Chief of Police, Chris Burbank answers questions from the media during a press conference outside of the City County Building the day after the deadly shootings at Trolley Square. 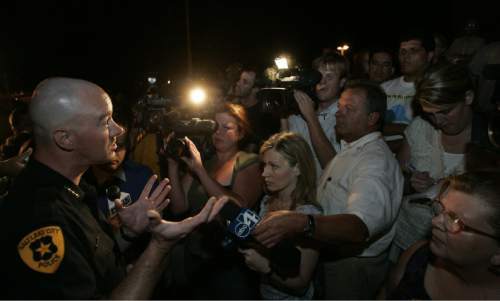 | Tribune File Photo Police Chief Chris Burbank answers questions from the media and an angry group in front of the church across the street from Destiny Norton's home on July 24, 2006. 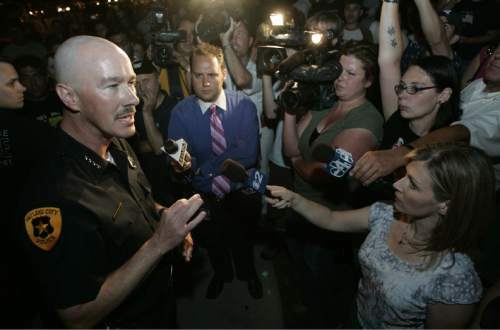 | Tribune File Photo Police Chief Chris Burbank answers questions from the media and an angry group in front of the church across the street from Destiny Norton's home on July 24, 2006. | Tribune File Photo Police Chief Chris Burbank answers questions from the media and an angry group in front of the church across the street from Destiny Norton's home on July 24, 2006. | Tribune File Photo Police Chief Chris Burbank answers questions from the media and an angry group in front of the church across the street from Destiny Norton's home on July 24, 2006. 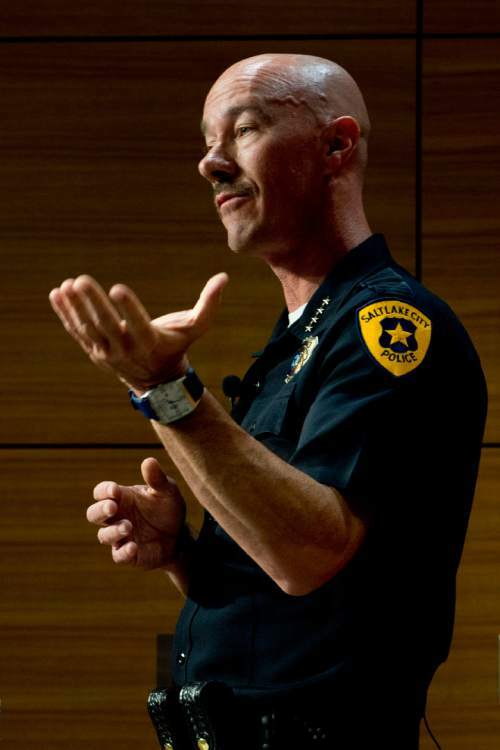 Weeks after he became Salt Lake City&apos;s police chief, Chris Burbank met an angry crowd. The group was furious that it had taken police eight days to find the body of 5-year-old Destiny Norton inside her neighbor&apos;s house. People were yelling and cursing at officers who stood alongside police tape on 500 East near 700 South. It was July 24, 2006, and the scene was attracting onlookers who were leaving the Pioneer Day fireworks in Liberty Park. Burbank arrived and explained the challenges his officers faced in looking for Destiny. Within minutes, people had calmed. Instead of a riot, friends and family of the Nortons kept a peaceful vigil all night. Burbank&apos;s nine years as police chief was a mix of diplomacy, tough policing and public criticism. Along the way, Burbank enjoyed popularity among Salt Lake City residents, whom he was able to persuade  on its second time on the ballot  to fund a new public safety building. He drew the most praise and ire for his stance on immigration. Burbank was a stern opponent of local police enforcing immigration laws, and lobbied against such proposals in the Utah Legislature. His stance earned him support from immigration advocates and an invitation to speak beside President Barack Obama. Rep. Chris Herrod, R-Provo, meanwhile, tried to pass a bill with what was called the "Burbank rule," stripping the police certification of officers refusing to enforce immigration laws. The rule was dropped from the final version. 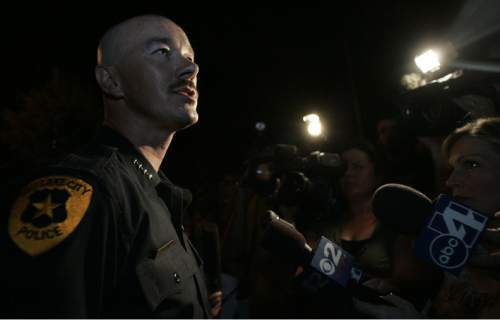 Salt Lake City officers shot and killed 15 people while Burbank was chief. The most controversial was the death last August of Dillon Taylor, who was shot by an officer who believed he was reaching for a weapon when the unarmed man lifted his shirt. Demonstrations in Salt Lake City over police use of force have remained peaceful. Burbank was a 40-year-old captain at the Salt Lake City Police Department when then-Mayor Rocky Anderson hired him as chief on March 21, 2006, bypassing candidates with more experience. He was a 15-year veteran of the department, having worked as a bicycle officer, a SWAT team leader, a gang detective and venue commander for the nine square blocks of downtown designated as Olympic Square during the 2002 Olympics. Burbank was the assistant to then-Chief Rick Dinse, who was retiring, and oversaw the police department&apos;s daily operations. The search for Destiny and the crowd outside the Norton home was the first episode to push Burbank into public view. The next came on Feb. 12, 2007, when Sulejman Talovic shot and killed five people and wounded four others at Trolley Square mall. It was Burbank who announced the names of the victims at a news conference the next day, and in the months that followed, he attempted to start a public dialogue on how to keep firearms away from people with mental illness. Perhaps Burbank&apos;s most ambitious crime-cutting strategy came out of a stabbing later that year. In October, Stephen Atiana stabbed a man outside Pioneer Park, then ran into the park&apos;s interior and killed Christian Charles Draayer, 31, who lived in a condo across the street. A police officer shot and killed Atiana. Pioneer Park was filled with flashing lights as crowds were leaving a Utah Jazz pre-season game. The violence spurred Burbank to send undercover narcotics detectives to buy and sell drugs in Pioneer Park and the surrounding neighborhood, sometimes netting dozens of arrests at once. The sweeps continued for more than two years and were expanded to Main Street and Library Square. Similar types of sweeps were used to try to curb prostitution on North Temple and south Main Street. When Tim DeChristopher&apos;s conviction for interfering with bidding for oil and gas leases spurred protests outside the federal courthouse in 2011, Burbank was there, politely asking protesters to get out of the street. Those who refused were arrested, and Burbank was among the officers placing them in handcuffs. The following fall, supporters of the Occupy movement pitched camp in Pioneer Park in the park for a month. Burbank and city leaders allowed the occupation until one protester was found dead in a tent beside a propane heater and drug paraphernalia. Arguing the camp had become a public health and safety nuisance, Burbank gave the campers notice, then sent officers in to arrest those who refused to leave. Both the DeChristopher and Occupy protests and arrests were completed without violence. Burbank generally enjoyed good relations with Salt Lake City&apos;s police union and showed public support for officers he thought deserved it, even if those officers had critics. In 2010, a SWAT team searching for suspects wanted for the murder of a deputy in central Utah fired 10 tear gas canisters into a house that turned out to be empty. Burbank said the officers made the right decision. The gas contaminated the home and the county health department deemed it uninhabitable. The homeowners were furious, and the city reimbursed them for part of their $10,000 in damage. Last year, a public furor arose after Officer Brett Olsen shot and killed a dog named Geist. Olsen, one of the officers who stopped Talovic at Trolley Square, was in a backyard looking for a lost boy when Geist, a Weimaraner, charged at him. Two separate reviews found Olsen did not violate policy, and Burbank took no action against him. "There have been many incidences across the country where officers have responded inappropriately," Burbank said in defending Olsen. "That is not Salt Lake City. I will put how we do business against any police department in this nation." At a news conference Thursday, Burbank said he is probably done working in policing. He said he has "been in the market for awhile" for a new job, though he wants to remain in Salt Lake City. "I&apos;m not a politician," Burbank said. "I am a public servant and have always been proud to be a public servant. I have been courted for politics for all kinds of different offices and position and have always turned those down because my true pride and joy lies in serving the public."